30 Nov It’s Open House Weekend! 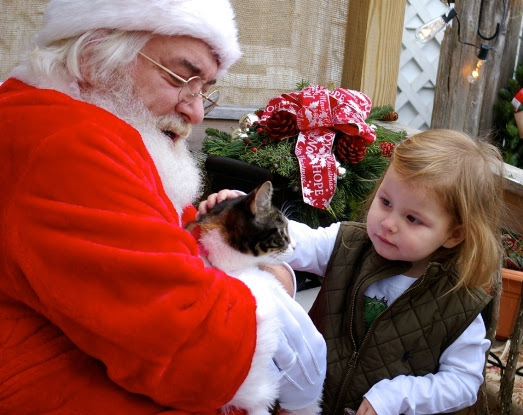 excited – from 10 am till 2pm this coming Saturday, Santa will be here. Bring your children, grandchildren, even your pets and pose for photos. On both Saturday and Sunday we will be serving delicious cookies, hot cider, hors d’oeuvres, and wine. The shop will be decked in all its holiday finery, inside and out. This is the weekend that kicks off the holiday season for us. WiltPruf as fast as our sap-encrusted fingers can fly. 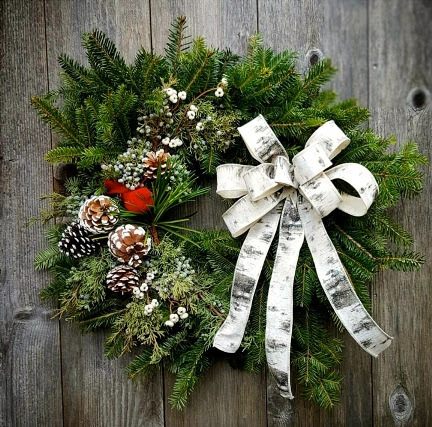 The walls are covered with hand-decorated wreaths and swags in our signature natural style. WE ARE MAKING OUR OWN ROPING- this year we invested in a roping machine and just wait until you see how full and lush it is. 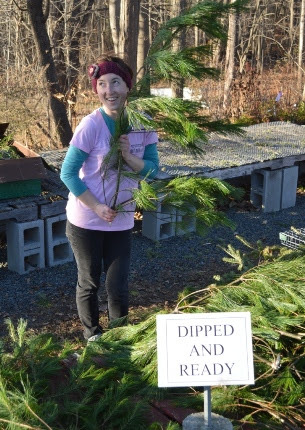 The second batch of CT grown, fresh cut Fraser fir Christmas trees are arriving this week. Be sure to stop in fast to get yours. Remember, we NAME our trees. People come back year after year, telling us how they save the name tags, sharing stories. After you take your tree home, be sure to give it a fresh cut and put it in a bucket of water until you bring it in the house. The sooner it begins to drink water again, the longer it will last. Once the bottom is cut, the sap quickly seals the trunk. You need to be sure that the tree is drinking water. Check the level in your stand and add water constantly. We also recommend that you add SuperThrive to the water. A few drops is all you need. My husband and I now have a humidifier next to our tree. We originally got it for our piano, but it really makes the tree a LOT happier. Also, a cool room is best for your tree. Drop the temperature down whenever you are not home and keep it away from radiators and hot air ducts. We have so many wonderful ribbons, birds, and berries to choose from to embellish your wreaths. Last week on Facebook Live we demonstrated what it means to customize a wreath. 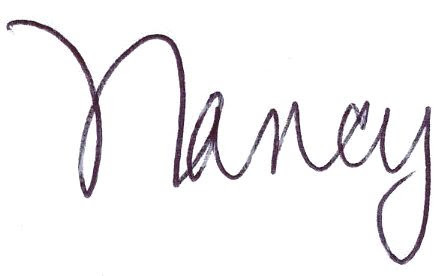 My staff will help you select exactly the size and style you want for your house. Don’t like a particular ribbon? We can switch it! 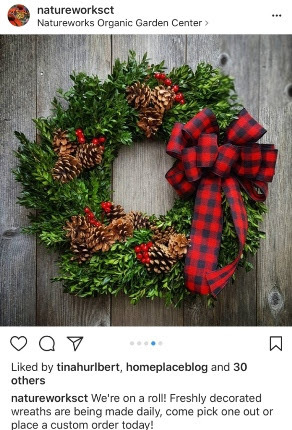 Need an extra large wreath for a big blank wall? We can make it! The same is true with any custom decor you can think of. We can make mixed evergreen roping to any length. Last weekend I made a low saucer of greens for a birdbath topper. We fill hanging baskets with greens, design cemetery pots and grave pillows with all-natural mixed greens and cones… you name it, we will create it for you. Tune in this week on Thursday at 4pm for another episode of Facebook Live. This week we will demonstrate how to embellish and hang our hand-made roping. If you miss it, all of our videos are archived on the Natureworks Facebook page. Inside the house, let us fill your home with the scent of fresh greenery in baskets, bowls, and arrangements of all sorts. 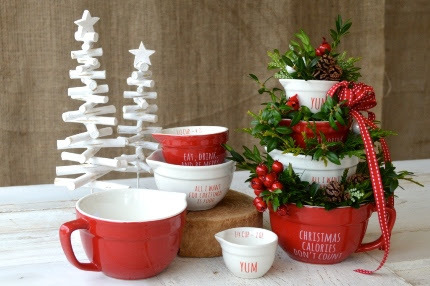 We have the neatest containers that will make double-duty gifts such as measuring cups and tea cups and tin mugs. We have wooden bowls, birch bark baskets, and teeny tiny pots that we will fill for you to give as teachers gifts or party favors. This week we will be restocking our indoor plant department. 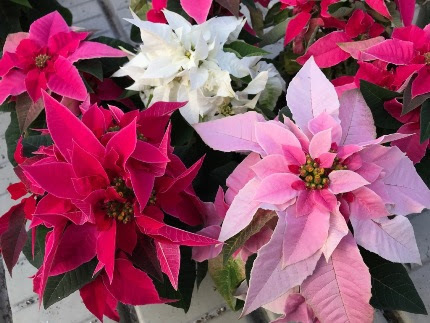 We hand select every high quality, locally grown poinsettia we carry, focusing on unusual varieties and stocking lots of little sizes for making tabletop gardens in combination with ivies, ferns, and other houseplants. As I write this, my staff is putting together an entire wall of terrariums! We’ve also restocked our succulents. We LOVE succulents and weave them into so many of our arrangements and indoor gardens. How neat is this? 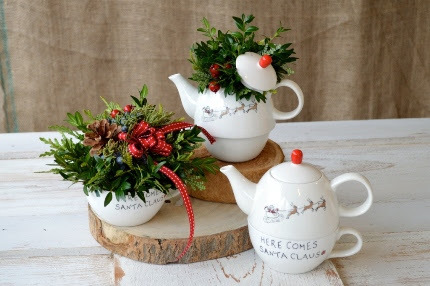 A small teapot sits atop a tea cup and heats up the cup while the tea is brewing. Give them filled with greenery and you have a gift within a gift. The beauty of shopping in a small store is that the staff is 100% invested in the items we sell. My STAFF shops for our ornaments and gifts, starting in January. They unpack them and display them. They all meet regularly, starting in late summer, planning what they are going to do. It is such a fascinating, creative process to watch. I am so impressed to see how they dismantle the shop, greenhouse, and nursery yard and rebuild it over the course of a very chaotic week. They buy the lumber, saw the wood, wield the drills, and put everything together themselves! Meanwhile, I am still on the road with the crews, meeting with clients and organizing jobs. It is only now, after Thanksgiving, that I finally get to settle into the retail world and become a designer of greenery instead of gardens for a few weeks. Can you tell how proud I am of these amazing Natureworkers? My landscape crews are also still hard at work. They are balancing putting gardens to bed with preparing new beds, clearing overgrown gardens (to prepare for planting next spring), putting in bulbs, and harvesting evergreen boughs. Each crew puts in time behind the scenes processing and bunching the greens. The guys on the installation crew pick up, unwrap, and display all of our CT grown Christmas trees, hanging them in the lathe house and leaning them on the stands that they built themselves. Before the end of December, they will also put the Natureworks gardens to bed and plant the rest of the bulbs. I know that many of you follow us on Facebook. Did you know that we also have a very active Instagram page? Different pictures are often posted there and many of our new customers come to us by way of Instagram. One final note… Eventually, we will be dealing with snow and ice. It’s fine with me if all that mess waits until after the holidays, despite the “atmosphere” a white Christmas imparts, it’s a lot of work to deal with it! 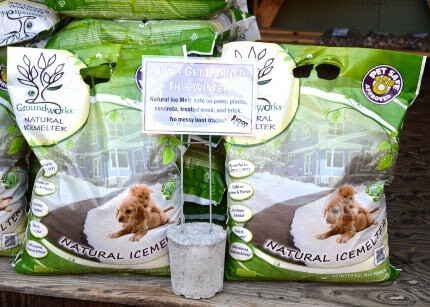 We now carry a wonderful, all natural ice meltthat is completely safe for you, your pets, and your plants. It is a fertilizer based product that won’t damage brick, concrete, or treated wood. Effective down to -23 degrees, it is harmless to groundwater and your precious garden soil. Stock up so you have it at the ready when the bad weather arrives. If you don’t use it all this year, it stores well in a shed or garage. Make plans to come in this week. I hope you can join us to celebrate our 34th Christmas Open House on Saturday and Sunday. Remember, we are now open Thursday evenings until 7- shopping in the evening is a relaxing way to wind down after a busy day. Share this email with your friends so that they too can learn how nice it is to Shop Local, Shop Small, and Shop Happy at Natureworks.